Jonathan Winters was a popular talk-show guest. 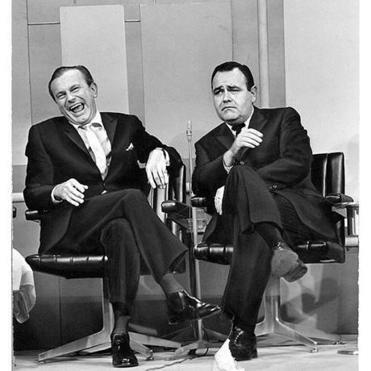 He appeared on Jack Paar’s show in 1963. Before that, he starred at the Riviera in Las Vegas (right). He made a memorable appearance in “It’s a Mad, Mad, Mad Mad World” with Ethel Merman and Dorothy Provine. NEW YORK — Jonathan Winters, the rubber-faced comedian whose unscripted flights of fancy inspired a generation of improvisational comics, and who kept television audiences in stitches with Main Street characters like Maude Frickert, a sweet-seeming grandmother with a barbed tongue and a roving eye, died Thursday at his home in Montecito, Calif. He was 87. His death was announced on his website, JonathanWinters.com. Mr. Winters, a rotund man whose face had a melancholy basset-hound expression in repose, burst onto the comedy scene in the late 1950s and instantly made his mark as one of the funniest, least definable comics in a rising generation that included Mort Sahl, Shelley Berman, and Bob Newhart. A one-man sketch factory, Mr. Winters could reenact Hollywood movies, complete with sound effects, or create sublime comic nonsense with simple props like a pen-and-pencil set. Jonathan Harshman Winters was born on Nov. 11, 1925, in Dayton, Ohio, where his alcoholic father (“a hip Willy Loman,’’ according to Winters) worked as an investment broker and his grandfather, a frustrated comedian, owned the Winters National Bank. “Mother and dad didn’t understand me; I didn’t understand them,’’ he told Jim Lehrer on ‘‘The NewsHour With Jim Lehrer’’ in 1999. ‘‘So consequently it was a strange kind of arrangement.’’ Alone in his room, he would create characters and interview himself. The family’s fortunes collapsed with the Depression. The Winters National Bank failed, and Jonathan’s parents divorced. His mother took him to Springfield, where she did factory work but eventually became the host of a women’s program on a local radio station. Her son continued talking to himself and developed a repertoire of strange sound effects. He often entertained his high school friends by imitating a race at the Indianapolis Motor Speedway. A poor student, he enlisted in the Marines before finishing high school and during World War II served as a gunner on the aircraft carrier Bon Homme Richard in the Pacific. After the war he completed high school and, hoping to become a political cartoonist, studied art at Kenyon College and the Dayton Art Institute. In 1948 he married Elaine Schauder, a Dayton native who was studying art at Ohio State. She died in 2009. At the urging of his wife, Mr. Winters, whose art career seemed to be going nowhere, entered a talent contest in Dayton with his eye on the grand prize, a wristwatch. He won, and he was hired as a morning disc jockey at WING, where he made up for his inability to attract guests by inventing them. “I’d make up people like Dr. Hardbody of the Atomic Energy Commission, or an Englishman whose blimp had crash-landed in Dayton,’’ he told US News and World Report in 1988. After two years at a Columbus television station, he left for New York in 1953 to break into network radio. Instead he landed bit parts on television and, with surprising ease, found work as a nightclub comic. In his stand-up act, Mr. Winters initially relied heavily on sound effects — a cracking whip, a creaking door, a hovering UFO — which he used to spice up his reenactments of horror films, war films, and westerns. Gradually he developed a gallery of characters, which expanded when he had his own television shows, beginning with the 15-minute ‘‘Jonathan Winters Show,’’ which ran from 1956 to 1957. He was later seen in a series of specials for NBC in the early 1960s; on an hourlong CBS variety series, ‘‘The Jonathan Winters Show,’’ from 1967 to 1969; and on ‘‘The Wacky World of Jonathan Winters,’’ in syndication, from 1972 to 1974. Many of his characters — among them B.B. Bindlestiff, a small-town tycoon, and Piggy Bladder, football coach for the State Teachers’ Animal Husbandry Institute for the Blind — were based on people he grew up with. Maude Frickert, for example, whom he played wearing a white wig and a Victorian granny dress, was inspired by an elderly aunt who let him drink wine and taught him to play poker when he was 9 years old. Other characters, like the couturier Lance Loveguard and Princess Leilani-nani, the world’s oldest hula dancer, sprang from a bizarre secret compartment of Mr. Winters’s inventive brain. The conventional television variety show did not suit him, but film did not seem the right medium either. Scripts stifled him. ‘‘Jonny works best out of instant panic,’’ one of his television writers in the 1960s said. He thrived when he could ad-lib, fielding unexpected questions or pursuing spontaneous flights of fancy. In other words, he made a brilliant guest, firing comedy in short bursts, but a problematic host or actor. In the 1970s and ’80s he was a frequent guest on ‘‘The Andy Williams Show,’’ “The Tonight Show,’’ and ‘‘Hollywood Squares.’’ He played Robin Williams’s extraterrestrial baby son, Mearth, on the final season of ‘‘Mork & Mindy,’’ and kept busy with voice-over work in animated television and films.